By the title you may think I have fallen behind in a task, work, chores or maybe life but this post is simply about falling behind in something I am addicted to and how I miss it terribly…..couponing. Life has been so busy and I have managed to keep up with work, chores, family and most tasks except for this one. By no means am I an extreme couponer (yet) but I am in love and addicted to coupons, the money it saves me and it allows me to help others. Sunday’s are my favorite day of course because I receive several newspapers. I prepare my space to sit down and begin my clipping, organizing and planning my shopping trip. I think about standing at a register and watch the total decrease and that drives me to keep the hobby going. Sadly, it seems that coupons are not as good as they used to be and the newspaper does not have as many as they used to. However, there are still deals to be found and coupons to use. 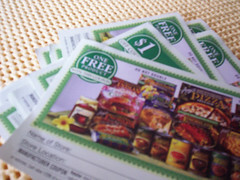 Coupons have allowed me to bless others, maintain my family and give me an inexpensive hobby. I have to get back to my healthy addiction! Coupons here I come. Are there any couponers out there? P.S. Thank you for reading my random outside of ASL post.